For the first time in almost five years, space shuttle Endeavour was moved to the launch pad Wednesday in preparation for a flight that will deliver teacher-turned-astronaut Barbara Morgan and her six crew mates to the international space station. The 3.4-mile (5.5-kilometer) journey aboard the massive crawler-transporter from the Vehicle Assembly Building started Tuesday night and ended at the launch pad almost seven hours later, shortly after 3 a.m. (0700 GMT) Wednesday. Endeavour is scheduled to launch on Aug. 7 on the second space shuttle flight of the year, a mission which a NASA manager said "has a little bit of everything." The last time Endeavour was at the launch pad was in November 2002 before its launch on a construction mission to the space station. It was the last space shuttle flight before the Columbia disaster killed seven astronauts several months later and grounded the space shuttle program for 2 1/2 years. Endeavour has since undergone a major tune-up. 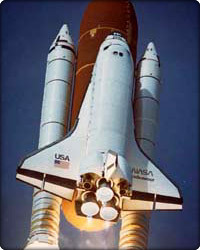 The shuttle's structure was inspected for corrosion. Filter and seals were replaced. More than 1,900 thermal blankets were examined. Two windows were replaced with thicker panes. Endeavour also has a new system which allows power from the space station to be transferred to the shuttle while docked. If the new system works properly, the 11-day mission will be extended by an extra three days. "We're really excited to have Endeavour fly again," Kim Doering, NASA's deputy manager of the space shuttle program, said Tuesday. "Obviously, having brand new belts and hoses and having just checked the structure and replaced all the tiles - they're brand new - makes this a very nice vehicle to climb on to." During the mission, astronauts will deliver a new truss segment, 5,000 pounds (2,300 kilograms) of cargo and fix a gyroscope which helps control the station's position. Astronauts plan to take four spacewalks if the mission is extended to 14 days. "It has a little bit of everything," said Matt Abbott, lead shuttle flight director. Morgan was selected as Christa McAuliffe's backup in the teacher-in-space program in 1985. McAuliffe died along with six others during the Challenger disaster in 1986. Morgan returned to teaching for several years after the tragedy but was selected as a full-fledged astronaut in 1998. On her first mission, Morgan will operate the shuttle's robotic arm, coordinate the transfer of cargo and talk from space to students at three schools, if the mission is extended.